You’ve probably heard about the so called good cholesterol (HDL) and bad cholesterol (LDL), and that you should boost the good and cut down on the bad. 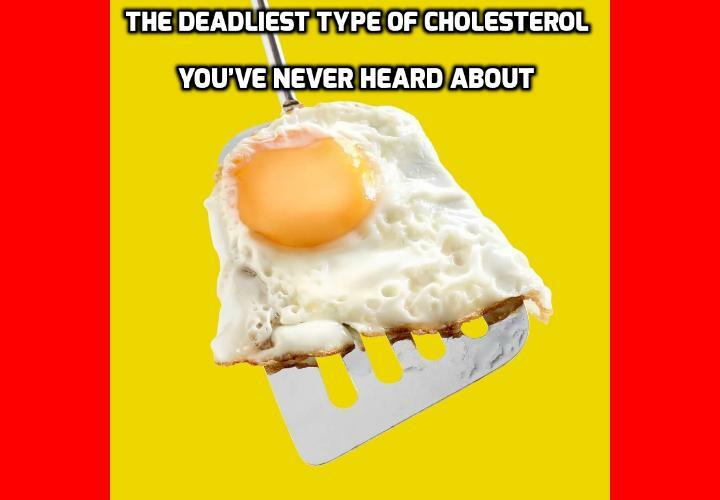 But a new study reveals a third type of cholesterol, more dangerous than anything you’ve ever heard about before. This will turn previous dietary advice on its head. Cholesterol is a waxy compound that circulates through your bloodstream and that is an essential ingredient of cell membranes and steroid hormones. As such, it is an essential substance, without which you would die. But most scientists traditionally believe that animal products contain too much cholesterol, and that excessive consumption clogs your arteries. That is why your doctor tells you to cut back on red meat and dairy products. A new scientific movement has now arisen that argues that it is not cholesterol, but oxidized cholesterol, that clogs arteries and causes atherosclerosis. Oxidation is the chemical reaction that takes place when something mixes with oxygen. Oxidized cholesterol is, accordingly, cholesterol that has come into contact with oxygen during the extraction, processing, or cooking of our food. Cholesterol appears in large quantities in animal products, but plants also make a form of cholesterol called phytosterols. This means that we should be wary of both animal and oily plant-based products that have undergone enough processing and cooking to introduce oxygen. Just think of how your vegetable oil is made. Most vegetable oils are extracted either via pressing or crushing products with a roller (virgin oils), or through the use of a petroleum solvent, normally after heating the oils first. Both these processes expose the seeds and vegetables to oxygen, in the press and during the heating. In fact, vegetable oils are often boiled further to remove impurities, usually by making steam (oxygen) bubble through them to carry the impurities out of them. This means that vegetable oils contain plenty of oxidized cholesterol, even before you heat them again in your own kitchen. This could be why a 2012 study in the European Journal of Lipid Science and Technology (EJLST) found milk powder and UHT milk has substantially more oxidized cholesterol than fresh milk. Several studies have demonstrated that egg powders contain more of it than fresh eggs (before you cook them, anyway), and why fermented products have extreme levels of oxidized cholesterol, according to EJLST in 2010. The more it is processed in air and with heat, the worse it gets. So how does oxidized cholesterol cause atherosclerosis and what is the evidence for this claim? Numerous scientists, such as Dr J.L. Witztum and Dr D. Steinberg, have performed countless studies in which they engineered oxidized cholesterol plaque in arteries and photographed it. Up to this point, the exact mechanism has not been fully understood. The cells that line your arteries identify the oxidized cholesterol as a threat. They become inflamed as a warning to your immune system that this cholesterol needs to be removed. Your immune system then sends cells to absorb the oxidized cholesterol, but once they absorb all this fat, they become trapped in the linings of your arteries and die there, smearing the fatty stuff they have just absorbed all over the place. Oops. are probably the healthiest sources of oil. The more research scientists carry out on oxidized cholesterol in food, the better the guidelines will become on what we should and should not eat. Why Soy Should Be Avoided in a Thyroid Diet? Why Soy Foods Should be Avoided if Your Have Thyroid Disorder?